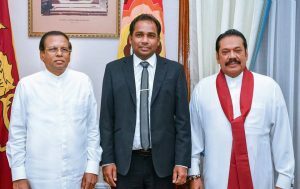 Tamil National Alliance (TNA) parliamentarian Vooghindran, who has been sworn in as Deputy Minister for the Rajapakse, has reported that he has been willing to join the United National Front government. Following the appointment of Mahinda Rajapaksa as Prime Minister on October 26, UNP MPs and Tamil National Alliance Member of Parliament, Jawaharlal Nehru, party junta and ministerial posts were appointed as Sri Lankan President Maithripala Sirisena. However, the court ruled that they could not become ministers in the next few days. The new government led by Ranil Wickremesinghe will be set up today after the defeat of the Mahatri-Mahinda government. In this situation, former UNP MPs Wijedasa Rajapaksa, Ananda Ditiakamage, Thunes Gangata, Asoka Priyantha, SP Navasini and Federation Congress MP VR Jayasendra have come forward to support Ranil Wickremesinghe. They have expressed willingness to join ministers in the new government, according to a Colombo English weekly news release. After joining the Maithri-Mahinda government, the Tamil National Alliance (TNA) and Ranil Wickremesinghe were critical of the Thursday.